This sparkly gold polish will turn you into Lucia in the sky with diamonds thanks to its plant-based formula, filled to the brim with different sized glitter particles. What’s more, its vegan formula is made from 84% plant-derived ingredients, so it gets a gold star for its eco-credentials, too! What does that mean? Well, quite simply, the way we see it is toxins are bad, plants are good. So we switched to renewable, plant-sourced natural ingredients to make our polishes – made from potatoes, to maize, cotton and manioc – instead of the traditional petrochemical-based alternatives. And, while we were at it, we also kicked the following nasties to the kerb: paraben, toluene, dibutyl phthalate, formaldehyde, xylene, styrene, camphor, resin of formaldehyde, benzophenone-1 and nanoparticles. 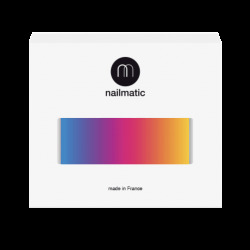 Made in France and ready to become your go-to nail polish. Before getting down to business, remove any old nail color, and wash and dry hands thoroughly. Nail polish does not like oils and creams or bits of leftover cotton wool fibres! 1. First up: a layer of base coat for protected nails, a nice smooth surface and a longer lasting manicure. 2. Now for your color: apply a coat of Lucia with just three brushstrokes. Start with one in the centre, followed by one either side. Our wide brush makes this simple yet pro technique is super easy. You’re welcome. 3. To dial up the glitter levels even more, go in with a second coat. 4. Finish with a slick of top coat for a super glossy, long-wear finish. Add an extra coat 48 hours later to extend wear even more. • Reveal your inner diva with a touch of Lucia on fingers or toes when you’re wearing a low key look, or go full-on diva and wear it to amp up evening wear to the max. • Removing glitter polish takes a bit of patience… Soak cotton wool in nail polish remover and hold to your nail, leaving in contact while you recite your daily mantra. Maintain gentle pressure as you swipe the cotton wool towards the free edge. Repeat until clean! Ingredients: ethyl acetate, butyl acetate, nitrocellulose, isosorbide dicaprylate/caprate, adipic acid/neopentyl glycol/trimellitic anhydride copolymer, polyethylene terephthalate, alcohol, synthetic fluorphlogopite, silica, acetyl tributyl citrate, isopropyl alcohol, polyurethane-11, n-butyl alcohol, benzophenone-1, polyurethane-33, borago officinalis (borage) seed oil, tin oxide, hydrolyzed corn protein, hydrolyzed wheat protein, hydrolyzed soy protein, leuconostoc/radish root ferment filtrate, ci 77891 (titanium dioxide), ci 19140 (yellow 5 lake), ci 77000 (aluminum powder), ci 15850 (red 7 lake), ci 60725 (violet 2).